iPage is one of the best and most affordable web hosting providers, offering comprehensive solutions to clients who wish to establish a strong online presence. In my opinion, for any business owner or company that can survive the fierce competition in the World Wide Web for more than a decade, they must have something in it. It doesn’t come as a surprise that iPage knows what a website needs to be successful, because they have been around since the year 1999. For every company, there will always be pros and cons. This entirely depends on the actual experience of clients. The same can be said for the online industry in general. iPage, for instance, also meets some positive AND negative feedbacks from their clients. The good thing about iPage, though, is that they do something about the complaints, always striving to provide better services. Right now, it’s time to lay down the hammer – the rant hammer. It’s like Thor’s hammer but heavier and has a rage face on it, ready to strike down with full force. Don’t even click that chat button. Seriously, those monkeys will waste your time. But that’s how it is with all the shared hosting companies. They outsource to this support center in India that does work for so many hosts, they even sometimes ask you which company you’re asking about. I admit I have had helpful conversations with their chat support people before. It’s hit or miss, and honestly, you’re way better off with REAL support from actual knowledgeable web geeks (hit up [email protected]). Those dudes will ALWAYS take great care of you. At least that’s my experience since 2007. Just hearing a friendly voice from a guy named Chris in North America, who helped me figure something out with my website over the phone… that makes it worth it. They say it costs $2.75/month. You get to the payment page and find you have to pay it as 1 year, 2 years or 3 years, with bigger savings/discounts for 2 and 3 years. See for yourself (currently they have a $2.75/month sale running for the next day or two). BUT here’s the good news: Even if you buy 3 years, you can get your money back if you’re unsatisfied for any reason, at any time. If you use iPage for 8 months and cancel and ask for a refund, you get the remainder of your money back. This is all standard practice among all the most popular shared hosting companies. They would go bankrupt if they only charged monthly, as it takes a lot of money to run a hosting company. Also, if you want to pay a monthly fee instead of a yearly discounted package deal, look into VPS, Cloud or Dedicated hosting… but instead of $3.50/mo it’s more like $150.00/month… no go. Game over man! If you love the world of black screens and cryptic messages in old-fashioned fonts (like I do), then you’ll be pissed to discover that iPage doesn’t allow SSH. Unfortunately most shared hosting companies (Read: hosting under $10 per month) do not offer SSH. I believe BlueHost still offers SSH access though. With that said, iPage allows basically everything else you need as a developer. They just block SSH to protect their customers/servers from malicious attacks and increase hosting reliability. I still use iPage because they’re good value for the money. Just like anyone else, they have their share of problems, but they are superficial for me, so I’m still happy with my websites on iPage. 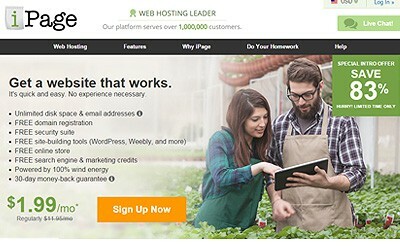 Of course, ever web hosting company has their drawback and iPage is no exception. However, they give their clients a much more solid experience compared to other web hosting providers. It’s affordable, provides unlimited bandwidth, has user-friendly features and options, and throws in a lot of cool features for free. So even with limitations, the benefits you’ll get will definitely outweigh it. SEE ALSO: Check out my full, detailed review of iPage. Get the scoop on their benefits vs other hosts before you sign up anywhere. CLAIM THIS LIMITED TIME OFFER: Get the iPage Essential Plan with 1-Click WordPress website setup for just $2.75/mo today. iPage delays charge credits they owe you by up to 9 days. They take float by delaying refunds. Not what I call an ethical business. Ipage will notify you about an automated charge to your card, but not about an expiration if you don’t automate a charge to your card, so they can charge $160 for the service that normally costs $14.95. How convenient!